At Technical Dimensions, we have a passion for the level of quality and performance in the Marques we service and upgrade. A year and a half ago, we took on a new line of cars which have exhibited the power, handling and build quality to compete with the likes of Porsche, Ferrari, and Lamborghini- Noble cars. 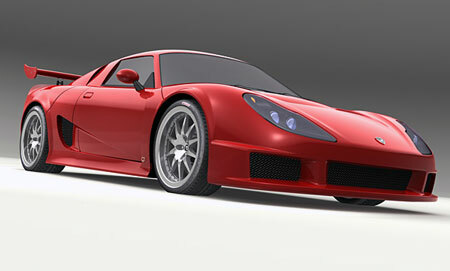 Noble is a small British sports car company based in the country side an hour North of London. The founder, Lee Noble, has made his mark in the sports car world with the M12GTO3R/M400 cars which have consistently outperformed many well known exotics and at a price point often 30 to $80,000 less. For those who know of Noble, there is sometimes the misconception that the cars are “kit cars”. This is inaccurate. Nobles were not federalized (to include crash testing, airbag inclusion, etc) in the United States. 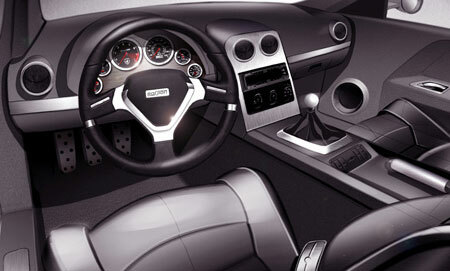 Thus, in order to purchase and register a Noble in the US, the cars must be shipped in under the “component car law”. If a vehicle arrives in the US complete but less engine and transmission, our government does not consider it a car. The law allows a citizen to “build” his or her own vehicle. After purchase of the full rolling chassis from 1g racing (the north american distributor for Noble), the install suite and the engine (from AER manufacturing), a reputable shop familiar with Noble is selected to perform the install of power train, alignment and a/c charging. Upgrades from M12GTO3R- upgraded Bilstein inverted coil overs, front sway bar, larger garret turbines, upgraded ECU mapping, full alcantera trimmed interior w/ carbon fiber bucket seats. For full specifications, please see www.noblecars.com or www.1gracing.com. 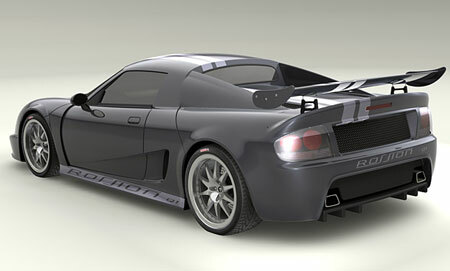 At Technical Dimensions we offer a full range of services for Noble cars and are authorized to perform warranty work. Prices vary- navigation available as well. Please call. Includes oil service w/ Mobil 1 synthetic motor oil, oil filter, coolant pressure check, a/c check, remove and clean fuel filter, drain and flush fuel tank (recommended as per factory), nut and bolt check throughout. Includes oil/filter change w/ Mobil 1 synthetic oil, clean fuel filter, clean and oil K&N filters, renew coolant, balance and set tire pressures, perform compression test, renew brake fluid, nut and bolt check, inspect drive belts and advise, replace wiper blades as neccessary, check all light bulbs, check ECU trouble codes/adaptation, road test. We have recently completed 6 months of extensive R&D with our client Derek Whitis’ M400- Derek recently placed 1st in class and 7th over all in the Cannonball Run 1 Lap of America. 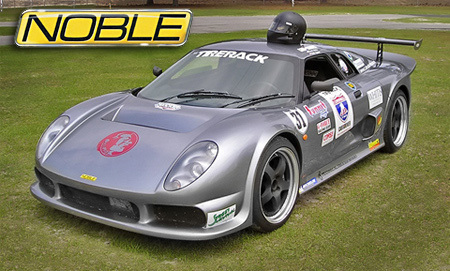 We have tuned the Noble M400 to 488 Wheel Horse power and 530 wheel foot pounds of torque- we have not been able to verify any other tuners thus far that have achieved this level of reliable performance from the M400. The wet skid pad during the One Lap of America. 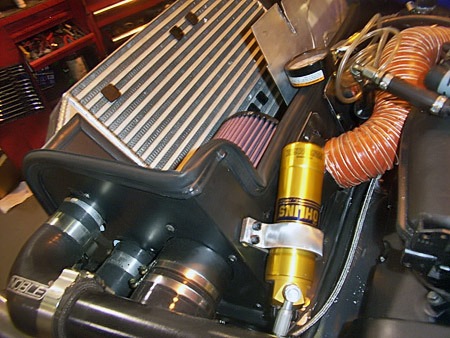 $45,000 (the kit includes every engine upgrade we offer to include turbines, piping, BOV, valve train, hoses, clutch/flywheel, fueling upgrades, Earls lines and fittings, heat shields, tunnel and engine cooling, inlet cooling,engine management, fluids, dyno time, labor and more) For more info, call- serious inquiries only. This is the kit every Noble owner will want…for some it will be a need. With 650 crank horsepower behind you, little can stand in your way, on or off the track. 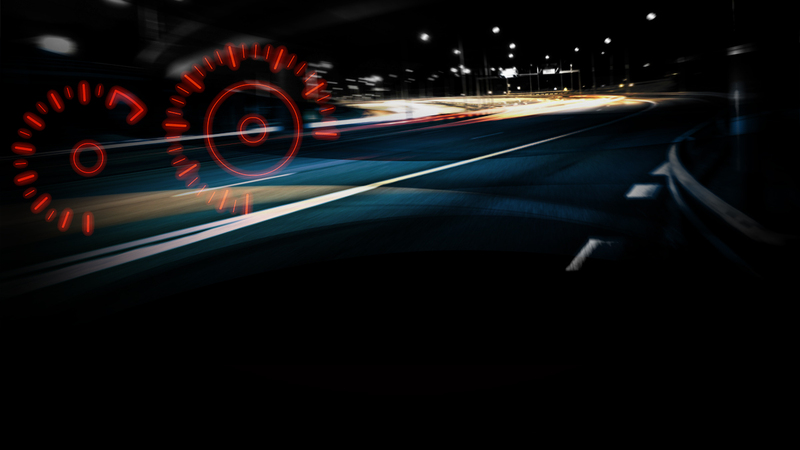 The raw power pulls all the way to 7000 rpm’s as cars melt into your rear view mirror. Rolling into the throttle between shifts is a visceral experience- though boost comes on smoothly, wheel spin is possible even at 80mph in such a light weight car as the Noble. Please check back as we will be adding more content and mods soon. For those who track their cars know how quickly oil temps can peg- this kit includes an oil cooler blanket as you will need it to get the temps up on colder days- we rarely see more than 110C on the hottest days! 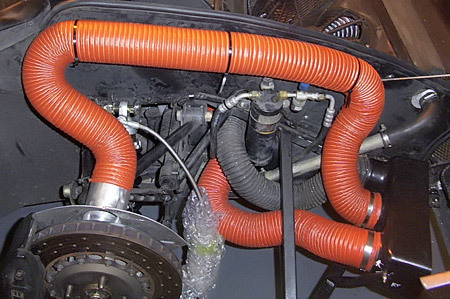 Includes large 3 duct air scoops, orange silicone ducting, tunnel adaptors, grommets, hardware and labor. Includes Kit A plus removing all tunnel components, hoses, wiring, piping, fuel tank and coating with liquid ceramic barrier. 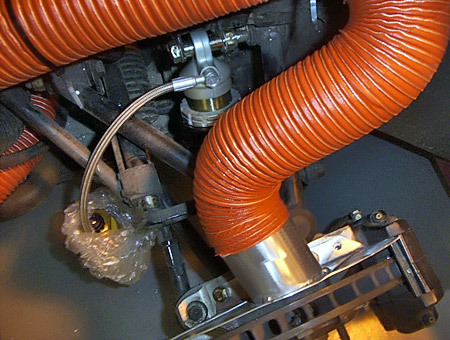 Like the oil cooler mods, tunnel cooling is critical to a comfortable drive and increased durability. 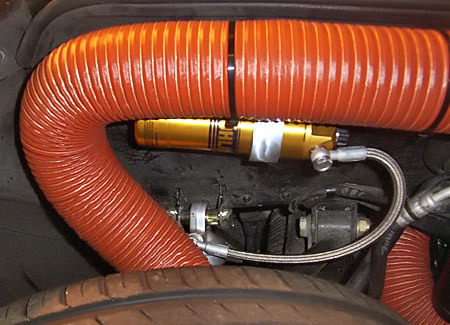 Our tunnel mods provide more air flow volume than any kit on the market and have been proven on the track and off. 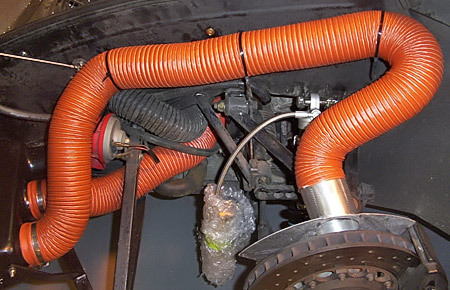 Includes front air scoop, orange silicone ducting, custom aluminum brake ducts, steel threaded inserts, hardware and labor. When used aggressively, your brake temperatures can rise to unacceptable levels causing fluid boiling, brake fade and rotor warpage. 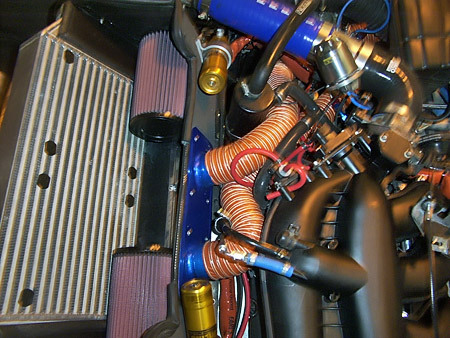 Our brake duct kit has been extensively tested to maintain 950-1000F brake rotor temperatures under hard use. 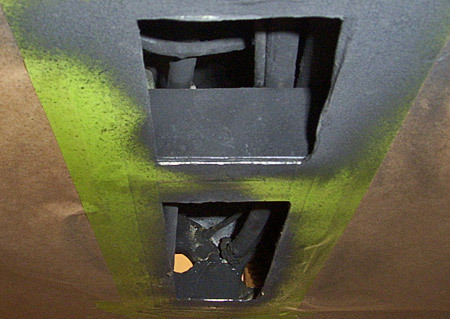 Brake Cooling Duct Entire Assembly. Thought your M12 or M400 had phenomenal handling characteristics already? 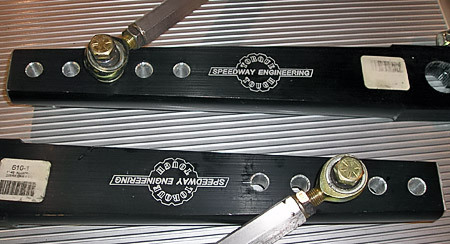 Think again- These 22/38 way adjustable Ohlins remote reservoir coil over assemblies are the best currently available and come in 2 different spring/valving combinations, track sport and full race. We have tested at 8 circuits and found the flexibility the Ohlins provide invaluable. On the street you will find the track sport units smooth and very consist ant. 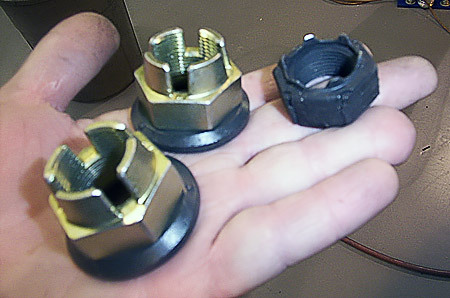 The Upgraded Rear Axle Nut vs. Stock. The M12/M400 has no allowance for increased negative camber front or rear. With our camber mod, there are 2 settings, stock or performance. 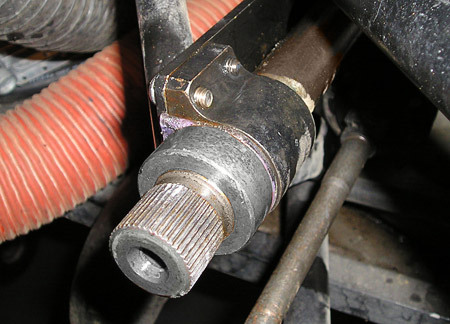 Billet Aluminum Stabilizer Arms and Drop Links. 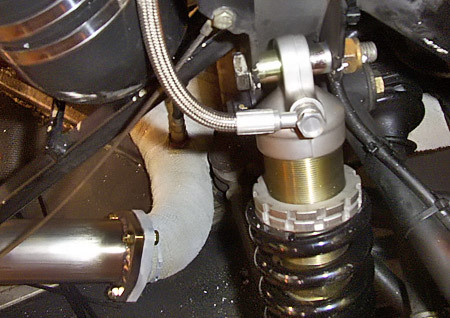 Noble cars do not come equipped with a boost recirculation or blow off valve as stock- To keep your turbine spooled up between shifts we use HKS Super Sequential and Tial blow off valves. Both have a terrific sound and are work nicely. 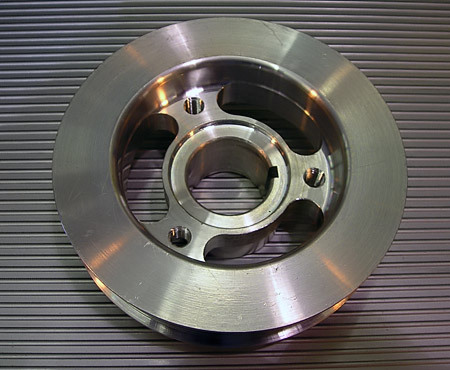 An underdriven (or power) pulley will reduce the number of revolutions your accessories are turned per crank revolution. This frees up horse power and allows your motor to spin up more rapidly-You will love the responsiveness! We have used this T6061 aluminum design for over 4000 miles running all accessories with no issues. 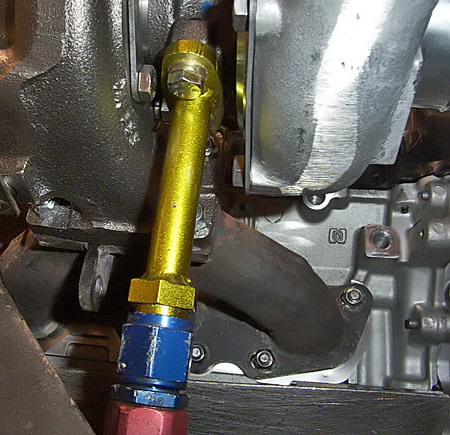 Lightening the valve train and installing performance valve springs is an absolute must when intending to run more than 1.1 bar or more of boost pressure. At that point valve float becomes a major issue. 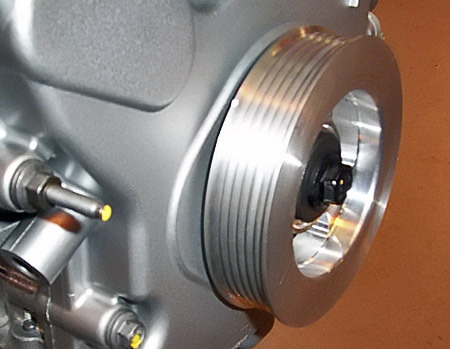 Engine rpm’s can be increased safely and engine crispness/responsiveness is GREATLY increased. 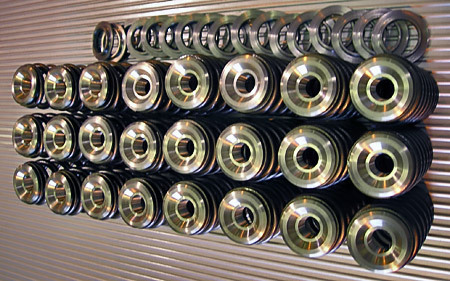 Our custom units are of the highest quality. For high performance only, this Bosch racing fuel pump will pump up to 172 litres per hour at 100 psi. Another must for big horsepower, high boost applications. Fits nicely in the stock location. REQUIRES custom plumbing, minimum -10 feed line, -6 pressure line and rewire fuel pump ground and separate fuel pump relay. 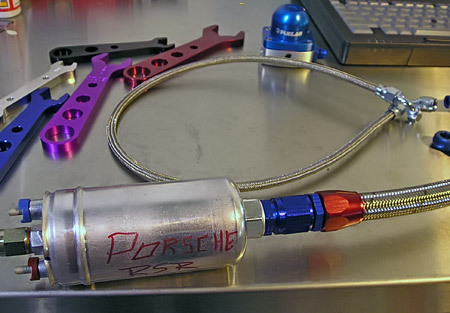 Retrofitted Bosch Fuel Pump Typically Found in Porsche RSR. 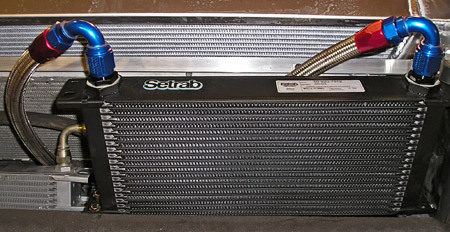 Can be a durable replacement for the fixed stock unit or a great platform to start from for bigger hp later. 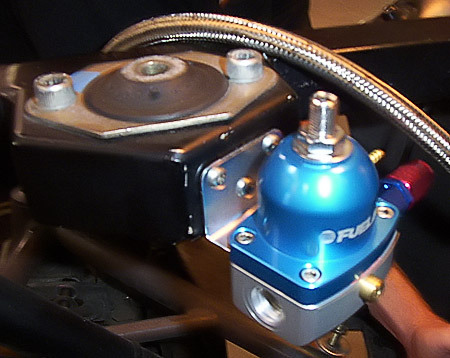 Referenced to boost and vacuum, a rising rate fuel pressure regulator will ensure that your car has adequate fuel pressure above and below your set point. For those running stock ECU/harness, we can relocate your ECU, harness and relay panels from the engine compartment to the cockpit. This lessens heat related ECU and harness failure as well as makes for easier servicing. Set of 4 bosch relays for the ECU relay panel- much hardier units than stock. 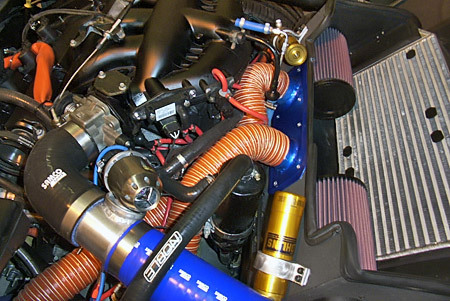 $7500.00 – Complete custom system built and installed on your car. 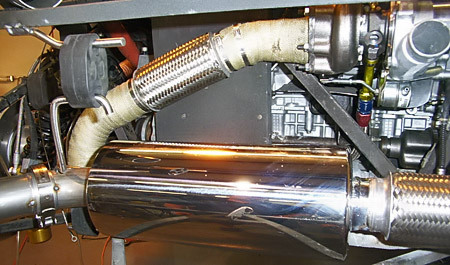 Currently we only build exhaust systems on a custom basis. 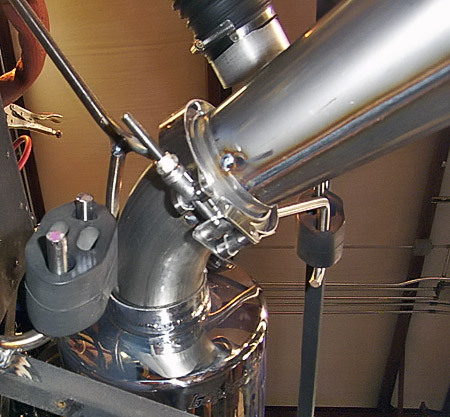 Complete systems include cat bypass with expansion joints, polished free flow muffler section, v-band clamps all mandrel bends, is t304 stainless throughout and features a single outlet tip only- Our setup is tig welded for durability and attractiveness and is very agressive- sound is clean inside and out. 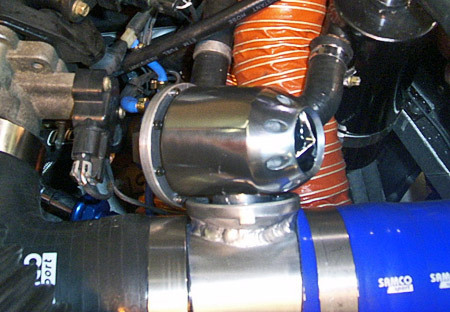 We also offer a megaphone outlet, non resonated (no muffler section)- It is VERY loud but sounds fantastic and is exceptionally free flow- has a similar sound to a 996GT3RSR at full throttle.